The Battle of Aleksinac was fought during September and October 1876. It was the decisive action of the First Serbo-Turkish War 1876-77 and resulted in a hard fought Turkish victory. I have written a feature article on the battle in Balkan Military History. In October, I visited the battlefield in southern Serbia, which gave me a different perspective on the battle that involved around 70,000 troops on each side. The border between the two countries in 1876 was just south of the Serbian town of Aleksinac, north of the main Turkish base at Nis. The Serbian army was largely a militia, although many volunteers supported the Serbs, including some 700 Russian officers. A few British officers also travelled to Serbia, along with a number of doctors and nurses who staffed hospitals. This was the year before the Russo-Turkish War, so the Serbs faced a largely regular Turkish army, which was better trained and equipped. The battlefield covers a large area and consisted of a number of linked defensive actions by the Serbs, punctuated with truces, which explains the length of the battle. The Serbs were eventually pushed back up the Morava valley and had to abandon Aleksinac. The battle is too vast to game in its entirety, so I decided to refight a typical action. Two Serbian brigades, although one consists of Russian and Bulgarian volunteers, holds a low hill against an attack by two Turkish brigades. 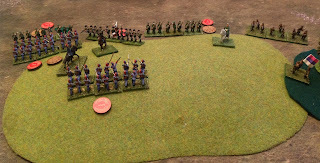 The rules were Black Powder and the figures are 15mm, from several ranges. There aren't any Serbian figures for the conflict, the nearest I had was Romanian artillery and later Serbian figures from the Balkan Wars. The battle opens with both Turkish brigades advancing on the hill and the surrounding woods. A cavalry regiment is trying to work its way around the left flank, where a Cossack regiment awaits them. 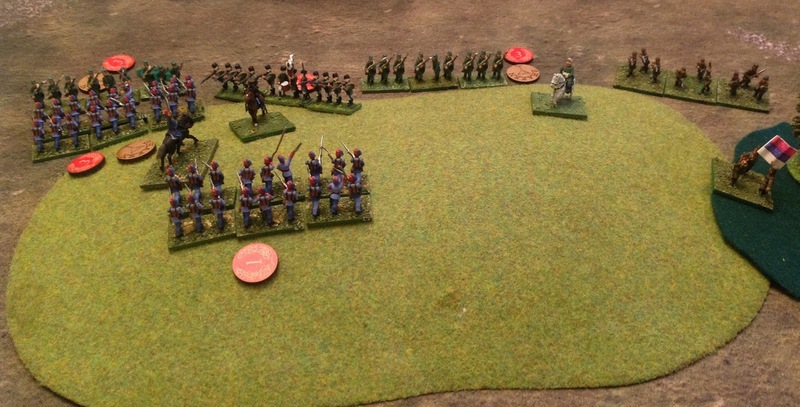 A key feature of Black Powder is the command rules. 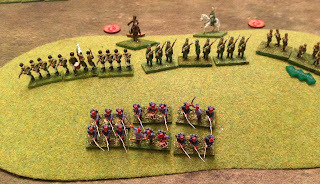 You have to pass a command roll to get your units moving and as this photo shows, the Turkish right flank brigade was very reluctant to advance into contact. 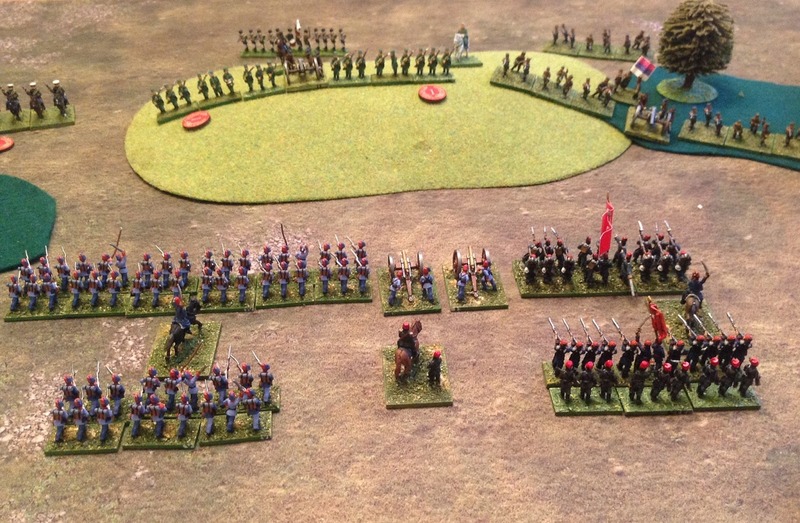 The left flank brigade charged forward and drove the Russian battalions from the hill. 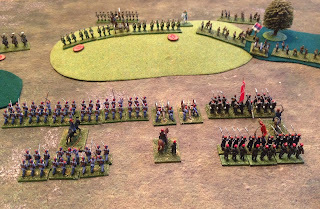 However, because the right flank failed to support the attack effectively, the Serbian forces were able to mount a counter-attack and drive the Turks off the hill. 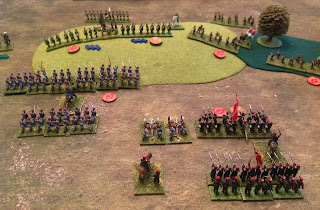 This was all pretty similar to the historical battle, which had many similar encounters. The article provides a narrative of the battle, an outline of the opposing forces and some further reading. Dave, I love your blog and your website. I enjoyed your report of your trip to the Aleksinac battlefield.